Back in January, we told you about TD Canada’s plan to launch a new budgeting app called MySpend for customers, which eventually launched in April. The real-time money management app aims to help customers keep better tabs on their spending, and so far it’s working, says the bank. Speaking with Reuters for the first time about customers using MySpend, Rizwan Khalfan, chief digital officer at TD Bank, said the app has been downloaded nearly 750,000 times on iOS and Android since April, representing 20 per cent of the financial institution’s 3.5 million mobile banking customers in Canada. 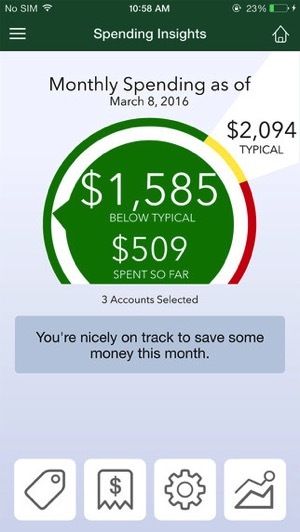 TD MySpend uses a colour system to provide a quick visual to customers on how much they have spent for the month, while also providing real-time spending updates. “The real-time nature encourages customers to change their behavior toward their financial goals,” added Khalfan, who said 30 per cent of MySpend users use the app at least twice per month on average. Was MySpend effective in curbing spending habits? Yes, as TD says on average, users saw spending drop by 4 to 8 per cent, or roughly 6 per cent of their mobile banking customers have been using the app and spending less money. TD Canada says they plan to market MySpend more to learn more about how customers are using the app. Also, Khalfan confirmed TD is considering how to add accounts from outside their financial institution to the bank, a move which would mean collaborating with rivals in both contracts and technical arrangements. Click here to download TD MySpend in the App Store. Are you using the app? Has it helped you curb your frivolous spending?